Want to have an easier PC to iOS file transfer? If yes, you have just landed on the right page. Exactly, there are times when you look to send your files from PC to iOS and it really becomes irritating when the whole process seems like a headache. Means, a lot of sync issues, file deletions, file lost etc. However, we have got the perfect solution for you. With iMyFone TunesMate you can perform both PC to iOS file transfer and iOS to PC transfer super easily. Let's learn more about TunesMate. While you may face a lot of complications with the normal/common methods available to transfer files, TunesMate makes it all easy for you. Produced by the renowned family of iMyFone, TunesMate is the best third party alternative specially designed for iPhone/iPad/iPod Touch users with Mac and Windows. Think about data transfer, sync, and custom ringtones or even backup, everything is possible with TunesMate. Thanks to its two-way transfer functionality that always amazes iOS users worldwide and makes it a mandate iOS app. 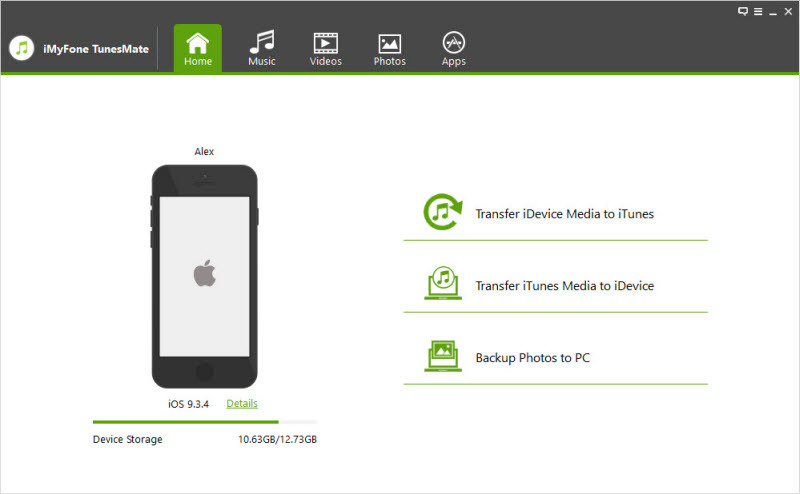 Its two-way transfer functionality enables you to transfer your files from PC to iPhone and iPhone to PC. So, videos, photos, music, apps or more, transfer anything effortlessly as per your wish. Feel limitless in importing and exporting your files across devices. Have full control on your files when you transfer them from your iPhone to iTunes PC or from iTunes PC to iPhone. Share your iPhone media and iTunes library with anyone from your friends and family, even without taking the pain they all use different Apple IDs. Get a full hold on what you're transferring while previewing the files you select. Check your files to your satisfaction and allow them to transfer effectively. No more complications and time wastage now, transfer all your favorite files just in a click and enjoy the ease. 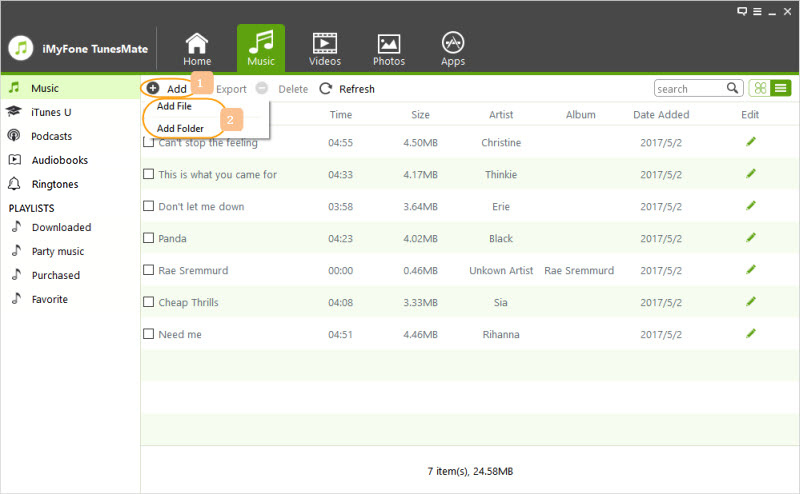 Performing PC to iOS file transfer is simple with TunesMate. You can do it just in a few steps. First launch TunesMate on your computer. Use a USB cable to link your iOS device to your computer. Click on the option Music in the top menu and click Add and then Add Files/Folder. 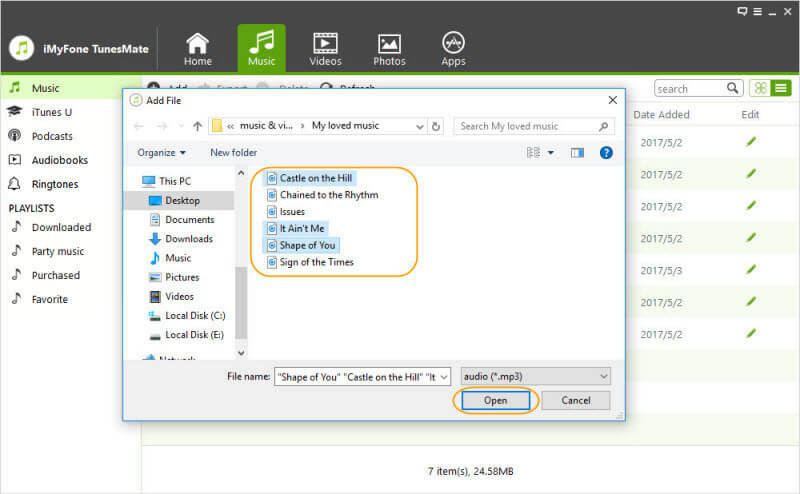 Select your music from the folder on your computer to transfer. It's done, enjoy! Download TunesMate for free and have a try now!